VPS2DAY Review 2019: Is VPS2DAY a Good Hosting? They may be new as a company, but the friendly folks at VPS2DAY are no strangers to the web hosting scene. Their small team has over a decade of experience in the industry and have made it their mission to provide their customers with high-performance, low-cost VPS alternatives to dedicated servers. They may be a new web hosting agency, but VPS2DAY are no strangers to the web hosting scene. Their small team has over a decade of experience in the industry and have made it their mission to provide customers with high-performance, low-cost alternatives to dedicated servers. Founded in 2014, VPS2DAY focuses on providing stable and reliable VPS hosting services in Europe. 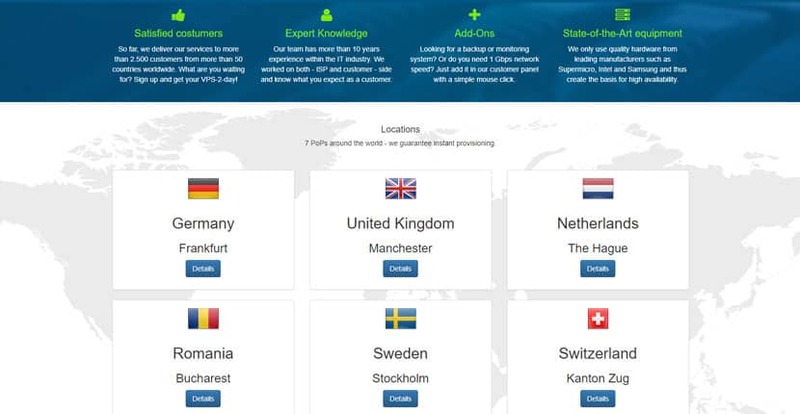 Clients can choose from seven available points of presence (PoP) globally: Germany, the United Kingdom, the Netherlands, Romania, Sweden, Switzerland, and the United States. They’re headquartered in Germany and their website is available in both German and English. They serve over 2,500 customers from 50 countries around the world. VPS2DAY has narrowed their portfolio of services to a single core offering: high-quality VPS hosting. These come with your choice of Windows or Linux as an operating system. Almost immediately after you make payment, your VPS will be deployed and ready to go. If you’ve opted for Linux, your OS will be installed automatically, but if you’re going for Windows, you’ll have to install this OS on your own. VPS packages come with a minimum of 1vCPU core, 1024MB of RAM, 25GB lightning-fast SSD storage, and a single IPv4 and IPv6 address. The cheapest VPS package is only available for Linux, but thereafter all packages are available for either Windows or Linux. By default, you’ll have a bandwidth of 100Mbps. This comes with a fair use policy. If you feel like you’d rather have more, you can raise this to 1Gbps in your customer control panel with a single click – though of course, additional fees apply. The same goes for their backup or monitoring systems: you’ll have to add this on separately because they won’t come included in your standard VPS packages. The VPS2DAY website cites a 99% uptime SLA, which is low by VPS hosting standards – most solid web hosting providers will offer at least a 99.9% uptime guarantee. Pricing-wise, VPS2DAY is definitely one of the most affordable VPS hosts on the market. This is a benefit that comes from specialization: you can cut operating costs and focus on streamlining your systems to promote quality and affordability at the same time. An additional perk of going with VPS2DAY is that they don’t tie you down with any contracts. You pay month-to-month and can cancel, adjust, or even move your plan to a different PoP location at any time. You get up to 30 days of free hosting if you’re willing to prepay for at least three months on your contract, however. There’s no free VPS hosting plan available, but they do have a 48-hour money back guarantee. While this may seem extremely short, bear in mind that most hosts won’t provide any sort of refund on VPS plans, so VPS2DAY actually does fairly well in this regard. One thing I didn’t like about VPS2DAY though: their support channels seem very limited. All they have right now is a contact form on their website – and not even a ticketing system at that. They have a helpdesk as well, but this only has about two dozen articles available. Also, bear in mind that VPS2DAY, by default, is an unmanaged VPS hosting service – you can always request for additional help, but they’ll likely charge you for any customizations or configurations. For a specialized VPS host, VPS2DAY is a decent choice. However, users will need to have a good degree of technical knowledge and experience to get the most value out of their packages – or their plans may not seem all that affordable after all. Sandra is a writer and editor based in Singapore. Sandra keenly understands the need for businesses to remain on the cutting edge with the latest technologies and enjoys researching and the newest developments in tech. Wondering how VPS2DAY stacks up against other Web Hosting companies? Enter any other Web Hosting company and we will give you a side-by-side comparison.